My pantry is one of the areas in my house that I have yet to address because ugh. In other words, it has been a complete disaster since moving in. I haven’t gotten to it yet because I haven’t had the time to figure it out, but also because I’ve had the interesting challenge of living with 3 other girls that also have groceries and want to keep things separate. You know? For the longest time, we just each had our own shelves, but after awhile, things just got to be crazy messy and we needed to come up with something that would work for everyone. It also seemed practical for us to share “common” pantry items like flour and sugar because it would be silly for us to have three version of the same thing – unless one of us was particular about a certain kind or brand. Regardless, there had to a better solution than what we were working with. Come to think of it, I’m kicking myself that we didn’t take a “BEFORE” photo because it was a serious nightmare y’all. Like BAD. First up, we used these cute white tosca baskets from The Container Store for easy, individually packaged grab-and-go snacks for when we’re running out the house and don’t have time to make something. Side note: I have no idea WHY we have so much peanut butter! Oh wait, yes I do. It’s because all 4 of us have our own jar. I guess that’s just part of living with multiple girls (ha!). But for stuff like this, we put it all in the same place, and then have our initials on the bottom. I imagine most people don’t have THIS much JIF lol. The rack for soft drinks is BY FAR my favorite part! I just can’t get enough of it! Because I don’t know about you, but I’m never motivated to tear those little plastic holders off and actually put them up. So I’m hoping this will keep me motivated and it’s also nice to actually have a place for them to go! Especially since we can’t always put them right in the fridge (not enough room!). After working with Margaret of Neat Method on my closet, she offered to help me figure out the pantry situation. And I was like umm YEAH, (#duh – we need it!). It took a few months to get everyone’s schedules aligned, but I’m so excited to finally be sharing photos of our new and improved pantry! 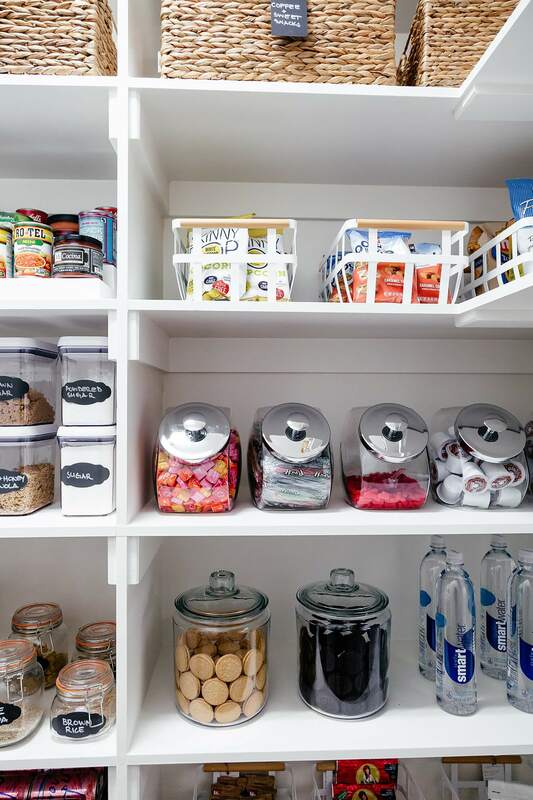 I also thought it might be helpful to share a few tips Margaret shared with me regarding the process she went through in order to sort my pantry – in case you’re in need of overhauling yours soon! There are so many great benefits to keeping your pantry organized. First off, it is a whole lot easier being able to clearly see what you have stored in there. There have been so many times when I’ve walked into my pantry and not known where a particular sauce or canned good was hiding. It can be extremely overwhelming when your items aren’t organized by type or when you don’t realize you are all out of an item. Which leads me to point number two. 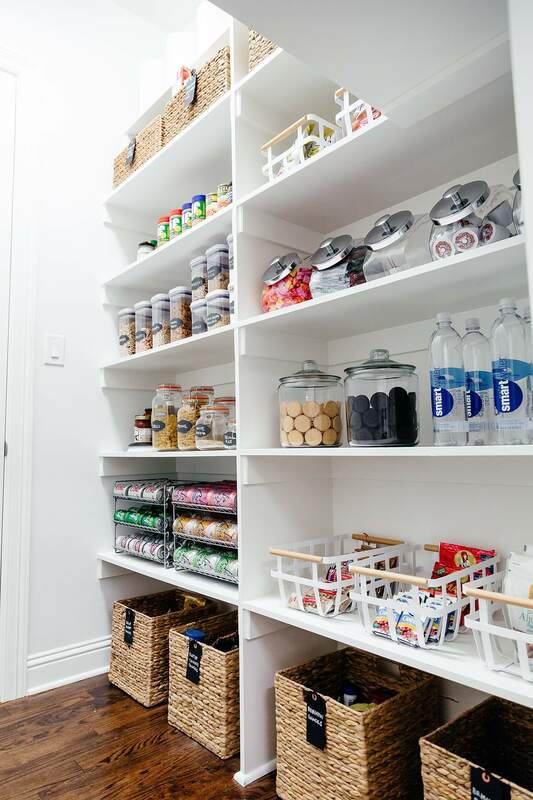 Having an organized pantry can actually help you efficiently grocery shop – who knew?! Once all of your food is organized, you will be able to clearly see what items you have in stock and what you don’t. It will make writing your grocery list a lot easier and keep you from overbuying the same item that you might already have an excess of (hello 7 bottles of olive oil). That way you won’t be stressing about going to the grocery store and you will be saving money. 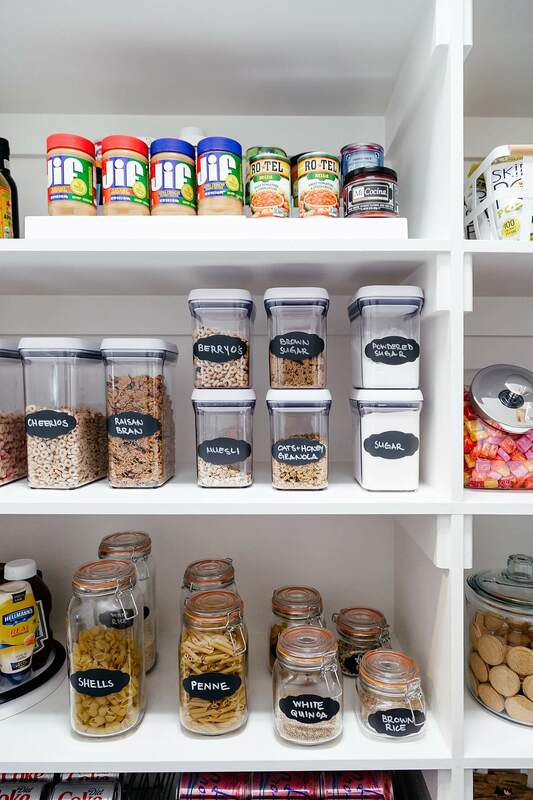 If you’re going to commit to really organizing your pantry, then let’s do it right. Start by pulling everything out of the current space and categorizing the items into themed categories. Each pantry might have different categories based on the items you keep in stock and dietary preferences, but here are some basic, broad categories to get started with: grains, baking, sweet snacks, salty snacks, breakfast, canned goods, cereal, spices, condiments, fruit & nuts, oils & vinegars, coffee & tea, plastic ware. While you are categorizing make sure to PURGE any expired items (especially spices and mixes) – use the organization as a way to start fresh in your space! After you categorize, consider the categories you want easily accessible (daily use) and the categories that you access on a more sporadic basis (baking, plastic-ware, etc). Plan to place all your daily items on the shelves you instinctively gravitate towards (typically eye-level and down a little). Lastly, place not as accessible items on the highest shelves. Make a list of items you need including baskets, risers, bins, airtight containers, etc. We have used multi-purpose items that are durable and functional but also stylish (obvi). Hyacinth baskets are great for items you don’t need to view, but you want to make sure to label them clearly so things don’t get mixed up again. Tosca baskets are perfect for snack items that rotate in and out since you can easily see the contents. Labeling is super important especially in pantries where many people can be popping in and out throughout the day to grab snacks, prepare a meal, or put up groceries. Labeling helps keep a high traffic space like the pantry organized and efficient. Plus, it’s just fun and cute, right? SO glad that’s done! My closet is still my favorite, but this is a pretttttty close second. I hope the tips help. If you have any questions or have ideas that I’m missing, don’t be shy in the comments. And who wants to come over for some PB and J sandwiches? LOL.